Become a member of the Ocean City Convention & Visitors Bureau (CVB), your convention and department of tourism. 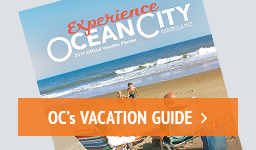 We are the official and recognized Destination Marketing Organization for the Town of Ocean City. Use the Town of Ocean City’s advertising outreach as part of your marketing plan by becoming a member of the CVB. Join the CVB now and begin enjoying the benefits! Your affiliation with OC CVB shows support of the local tourism industry and the importance of your business contribution to local tax revenues.